In researching my situation, I learned that Mclaughlin has been involved in lawsuits related to his brutality including the fatal shooting of Jeffery Barboa on August 3rd, 2018. I’m a marine, and was honorably discharged when I completed my service. I have no convictions on my record; I'm not on parole or probation. I own my home, I was on the porch of this home when McLaughlin pulled his pistol on my cousin, saying my cousin looked like someone who he saw speeding earlier. My cousin was sitting on his motorcycle in front of my house. A gun had been pulled on my him because he “looked like someone” the officer had seen speeding earlier. Obviously, the situation concerned me. From roughly 20 ft away, with a railing between myself and the officer, I started filming with my phone. You have the right to film a police officer in action as long as you’re not a threat or preventing him from doing his job. The officer told me to go in my house. I chose to stay on my porch and film because the situation was concerning. My camera panned and tilted, but I did not take one step off of the porch. 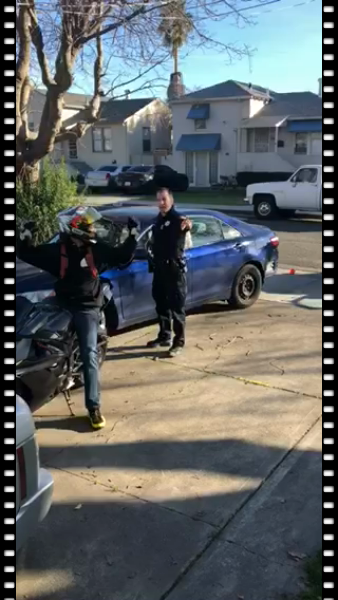 At that point, officer Mclaughlin approached me as you see in the video.